The A-dec 500 Three Dental Chair, pairs the comfort of the A-dec 500 Dental Chair with a smaller footprint due to its smaller delivery head. What are the main features of the A-dec 500 three Dental Chair? Unsurpassed patient comfort of the A-dec 500 three Dental Chair, featuring a soft start and soft stop system. A-dec 300 Delivery System (either in traditional hanging or continental whip arm system). Ultra-thin backrest that “flexes.” Enabling ease of operator access and pressure mapped upholstery ensuring all patients can find a comfortable position. The A-dec 500 three Dental Chair comes with a 5 year warranty. If you are thinking about buying the A-dec 500 Three dental chair for your surgery, or you would like to talk to one of our experts call us on 0800 298 5003 or fill in the enquiry form. Take an in depth look at the A-dec 500 Three and download the brochure. Hague understand that taking on a refurbishment when you are running a busy practice or when you are undertaking a squat site can be very stressful. Our Project Management Service team provide build quotations and co-ordinate trades to ensure your project comes in 'on time and in budget'. "I originally chose Hague Dental for this project due to several recommendations and their unprecedented reputation. From the offset the team were involved in the design, planning and fitting of our surgeries. They were reliable, approachable and ready to recommend cost efficient alternatives wherever necessary. I would recommend them to anyone and appreciate all their efforts in making my dream practice." Why not come and experience the A-dec 500 three at our Dental Practice Design Centre, near Gatwick. 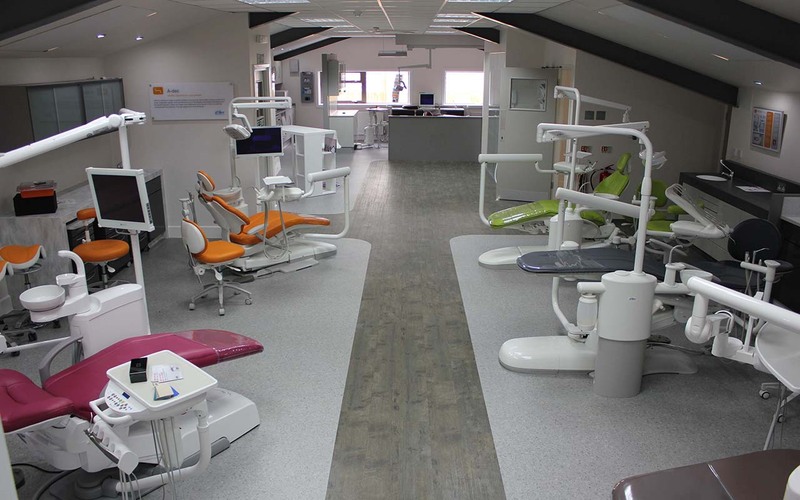 As well as the entire A-dec and other ranges of dental chair packages, you can view dental cabinetry ranges, lighting, flooring, reception desks and waiting room furniture, decontamination areas, radiography equipment and more. Appointments are available with our highly experienced consultants at your convenience including evenings and weekends. We understand the importance of keeping your down-times to a minimum and a offer same day emergency callout service. Our team old a large stock of parts on their vans,as well as a large stock of loan items should your require them. Our dedicated team are A-dec Certified Technicians.